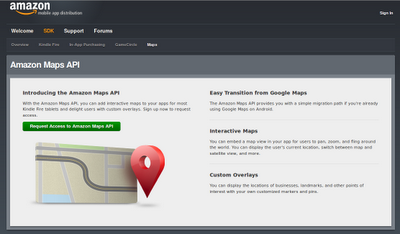 Following the footsteps of Apple in building own mapping services, Amazon today announced beta version of its own mapping API for the developer community. This move is in line with Amazon's strategy of distancing itself from Google. It must be noted that though Amazon's Kindle Fire devices run heavily customized version of Android, it never contained Google Maps. Also Amazon runs a parallel app store in place of Google Play store for its users. ....neither the original Kindle Fire nor its upcoming Kindle Fire HD have GPS capabilities, though many will be able to take advantage of location services using a Wi-Fi connection. In developed nations Wi-Fi can be leveraged very well, but when it comes to other countries where Wi-Fi networks are sparse, mapping which relies on Wi-Fi networks would be far more worthless. Amazon is steadily growing its ad-revenue stream through different means - first it was with screensavers on Kindle e-readers and now with mapping solutions the ads can be more target oriented, location based ads. Right from Google to Facebook to Apple to Amazon everyone is interested in getting their own pie with location based solutions. As always customer can be the king as he has every right to prefer one over another.